This shows just how important building up a word of mouth reputation is - with internet playing an important role in enhancing it. As well as making sure their website is accessible, up-to-date and full of content that demonstrates their expertise, lawyers should also concentrate on building relationships outside of the internet. This can be achieved through conferences and networking events for instance. 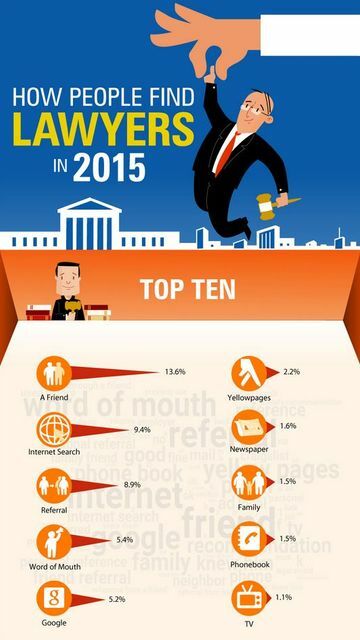 The data presented is based on a survey of more than “1,500 people nationwide who recently hired a lawyer.” “A friend” topped the list with 13.6% – however “internet search” and related web activity popped in slots #2 and #5 among the top ten. “Referrals” and “word of mouth” also ranked among the top ten. Yet, what the data doesn’t show is much of that activity today, arguably occurs online through social media and review sites for example.